HomeMagazineMore Low Milk Prices – When will Prices Improve? July Class and Component Prices were announced on August 1. The Dashboard of prices (Chart I) shows it all. The only thing that was up was dry whey, which increased the price of Other Solids, which is a small factor in the Class III price. 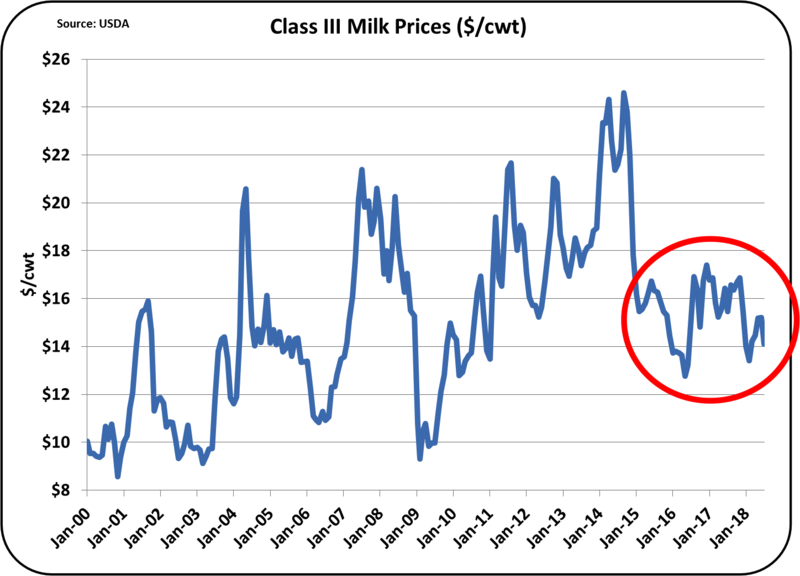 The price of Class III milk is stagnant (Chart II). 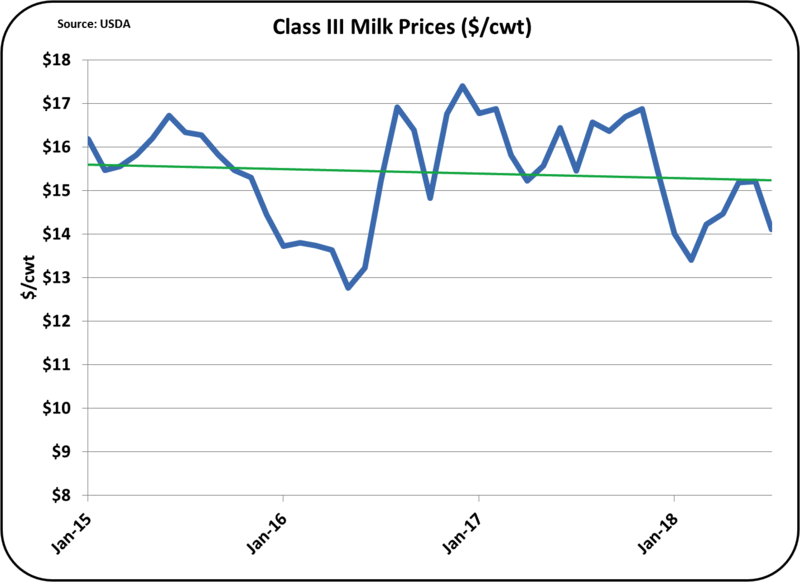 For the last three and a half years, the Class III price has ranged of $13 to $17/cwt. That is a record long period for relatively low prices. And the price is not only low and stagnant, but it is also slightly declining as shown in Chart III. The numbers indicate a trend to lower Class III prices. Chart IV shows the price of cheese. Comparing it to the Chart II, the price of Class III milk, the charts look identical except fo the color of the line. Clearly, the Class III price does follow the cheese price (click here for more detailed proof). Butter prices have been increasing for at least ten years (Chart V). It is not a short-term trend. 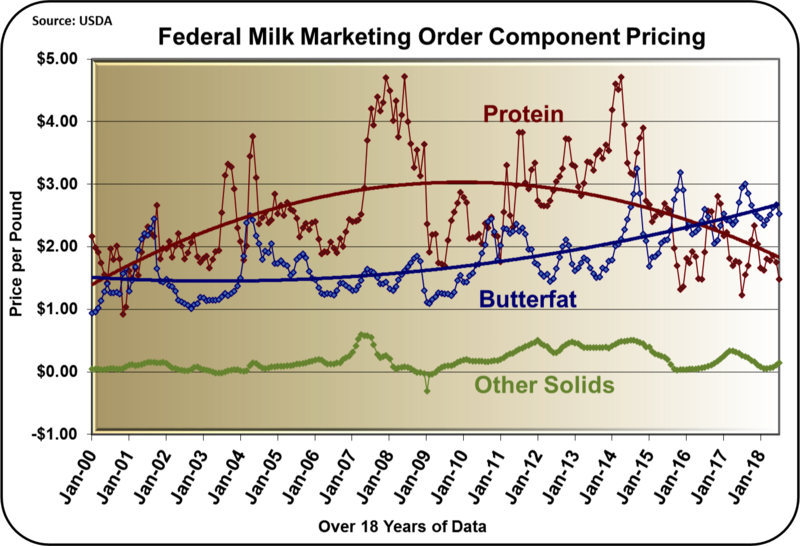 The rise in the value of butterfat is driven by the increased domestic and global consumption of butter. Unfortunately, a higher price for butter does very little for the Class III price. It primarily increases the value of butterfat and decreases the price of milk protein. Protein has decreased in value for four years. The protein price has decreased for two reasons, the increase in the value of butter and the decrease in the value of cheese. 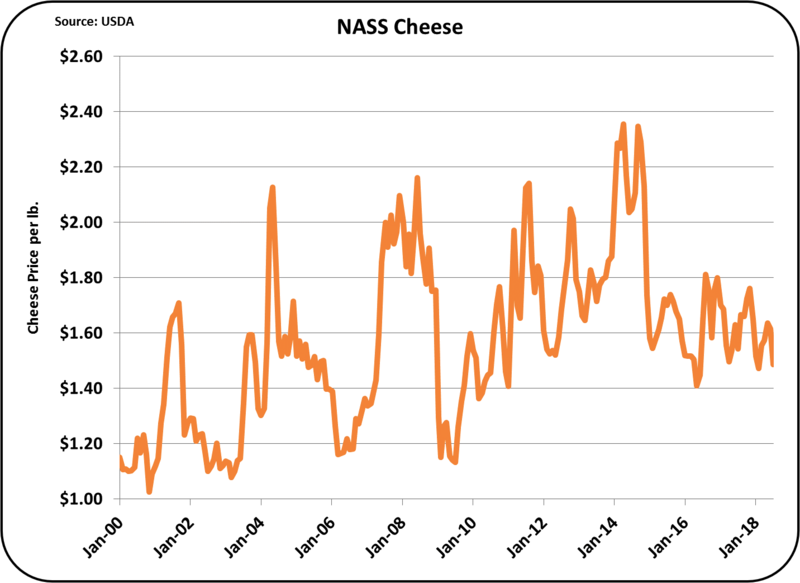 Cheese has suffered because inventories have been too high. The strong global demand in 2014 and the oversupply of milk have encouraged production of excess cheese. The strong exports of U.S. cheese quickly diminished after 2014, but cheese production continued as milk was plentiful and cheap. The result is too much milk, too much cheese and resulting low prices. So where is all this taking the dairy industry and when might milk prices improve? There is clearly too much U.S. milk. There needs to be a reduction in milk production. This seems to be a slow process. The most recent data comes from the National Agricultural Statistics Service (NASS). The monthly data is compiled monthly for the 23 states that make up over 90% of the U.S. milk supply. This data is current through the first half of 2018. While there is news of herd reductions forced by lower prices, the reduction in cows has not happened. As cows become more productive, milk volumes have continued to increase per the USDA-NASS statistics. 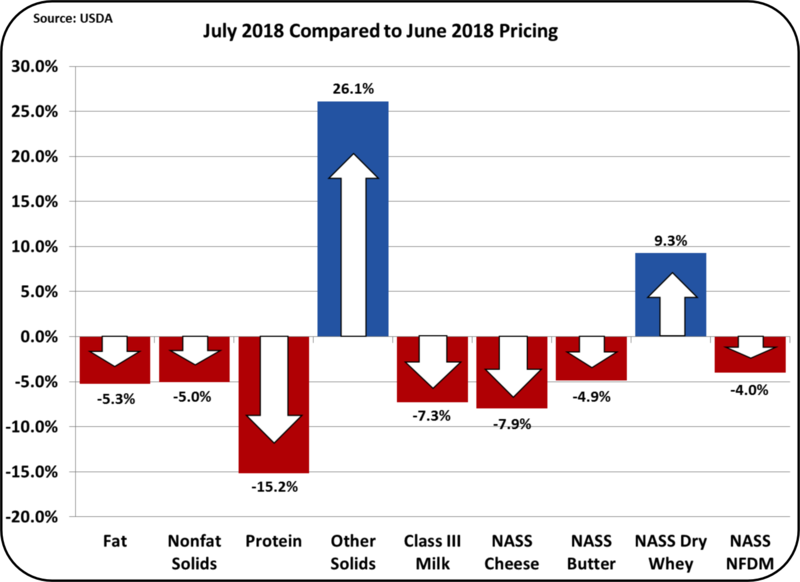 June 2018 milk production was up 1.3% over the prior year. CONCLUSION: The oversupply milk will continue. Where are butter prices going? As long as the consumption of butter increases as it has been doing (see prior post), supplies will be limited and prices will be high. What holds butter churning back? Butter is a unique dairy product because it requires only one component in the milk, butterfat. That leaves a lot of skimmed milk, which must be sold as products like Nonfat Dry Milk/Skimmed Milk Powder (NDM/SMP). While there is a large international market for SMP, there are a lot of strong competitors also facing oversupply. CONCLUSION: Butter churning will increase only gradually, leaving inventories tight and prices high. NDM/SMP prices will remain low with a global over-supply. Where are milk protein prices going? With a high price for butter and an oversupply of milk, cheese production will remain excessive and inventories will remain high. CONCLUSION: Milk protein prices will remain low. How can exports impact the above? Dairy exports are in a sense a compelling devil. When exports are strong, it seems like a panacea and a solution to achieve robust dairy product demand (eg. 2014). But exports can be very volatile, and disappear as quickly as they appear. On the other hand, milk production is difficult to quickly increase or decrease. Cows cannot just be fired or put on leave until volume demand returns. How can a producer best manage in this environment? Obviously, a producer has to be a very low cost producer. However, components are key. Fluid milk is dying a slow death, and growth products are centered around components, specifically butterfat and milk protein. Both provide substantial revenue. Just being low cost does not make for a profitable business. A concentration on maximizing components is also a necessity for survival.